NCover Desktop can generate Coverage Summary report only, from command line only. The NCover Report command is used to produce a self-contained HTML report from the command line. 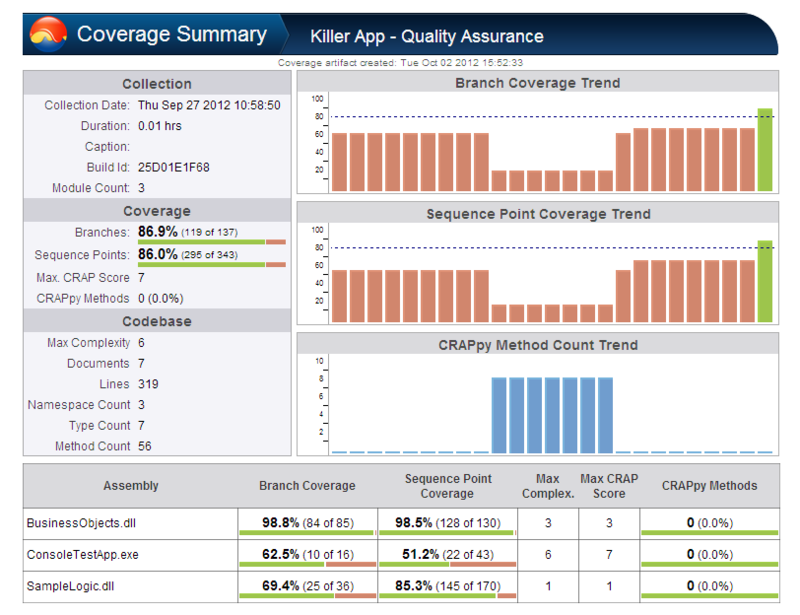 Code Central users can also generate the coverage report from the GUI. Code Central has options to create the original NCover 4 Summary report, as well as detail reports at the Class and Method level within an execution. The NC5 Code Central GUI allows report to be generated from any level of the coverage data. These reports will apply any post-coverage filter that is already applied to the data, or the user will be allowed to select a filter to apply when the report is generated. All NCover report GUI options are available from the Code Central command line, as well. The Code Central v5 and higher reports are self-contained and do not require a link back to Code Central to access the expanded data views. As a self-contained HTML report, this file can be kept as a build artifact, shared via email or as a static web page. All NCover HTML reports show the coverage results of the most recent execution by default, if no execution is specified by the user. NCover.exe report --project="ProjectName" --execution="Test1" --file="MyPath" --detail="summary"
--execution[=VALUE]    Specify execution by Caption, Build Id, or Date. --file[=VALUE]         File name for export. --filter[=VALUE]       Filter name or id. --execution=VALUE      Specify execution by Caption, Build Id, or Date. --file=VALUE           File name for export. NCover.exe report --project="ProjectName" --execution="Test1" --file="MyPath"
Summary: This is the original NCover 4 summary of coverage data by module, but without the drill-through links to Code Central. The detailed views are now contained in the Type/Class and Method reports. Class: This report displays the static analysis and coverage data of types defined within each module. 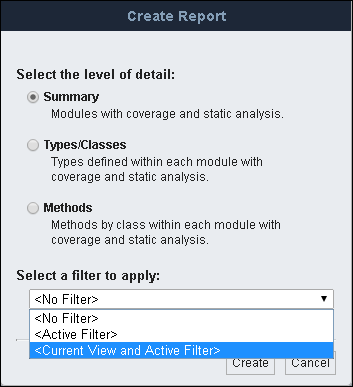 Method: This report displays the static analysis and coverage data of methods by class within each module.